DOS HERMANOS: GO EVERYWHERE, EAT EVERYTHING: RETSINA: YOU ORDERED CHIPS INNIT ? In normal circumstances words that would be aural Manna to Dos Hermanos but, when you're made to feel as if you're crashing a private party, sounded more like an order to eat up and go. 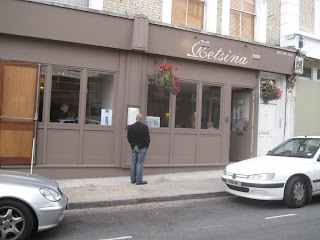 I'm sure it wasn't and I'm just as sure that the good people at Greek-Cypriot restaurant Retsina are very nice - it's just that it didn't seem that way to us at the time. A long time ago, in a galaxy far far away, DH were often to be found after a Rotherham United away game in a little Taverna on Charlotte Street. 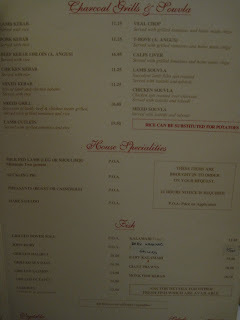 Sure, it wasn't as cutting edge as neighbouring joint Pied à Terre - then owned by Tom 'Pre-Pack' Aikens - but the food wasn't bad and there was a sense of fun that meant at that time you didn't really want to be anywhere else, certainly not next door anyway. 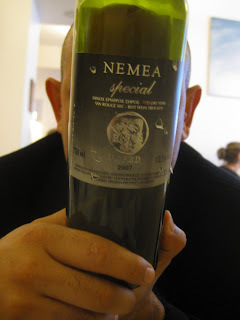 Sat in a dark corner at a pokey little table in Retsina we felt more like a couple of goy Woody Allens, stuck on the loser train rather than the two fearless urban dining warriors we really are. We wanted to be next door. There was scant recompense in the food. Despite a refurbished, modern interior the menu is avowedly old-school. You know there’s a good reason why a lot of old-school things stay that way. 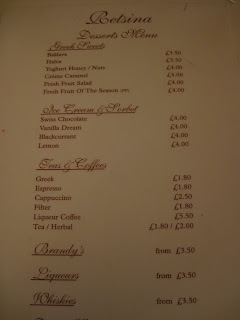 If you've ever visited the legendary Jimmy's in Soho or any number of similar places in London you'll know what I mean. 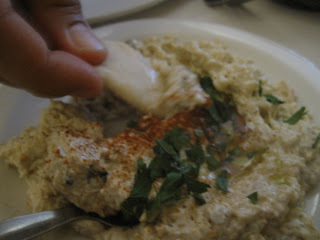 Dips of Pink Tarama and one of Aubergine were familiar to us from many visits to (shhhhh…) Turkish Ocakbasi gaffs. They were serviceable but no more. 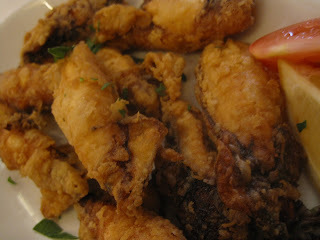 Less clever was a plate of Baby Squid that under the overriding taste of oil had more than a nodding acquaintance with the deep freezer. 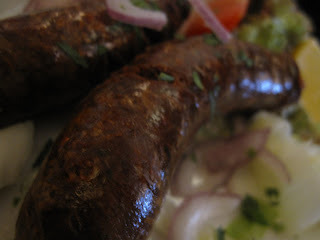 Loukanika Sausage had a tough thick hide that made it a bit of a challenging chew. Not necessarily a bad thing - I like things with texture - but here it was just down to bad preparation. 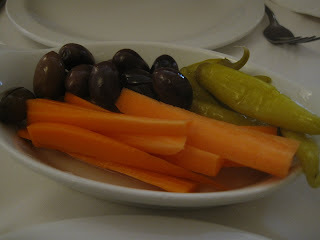 My main course of Keftiko was a decent enough effort. 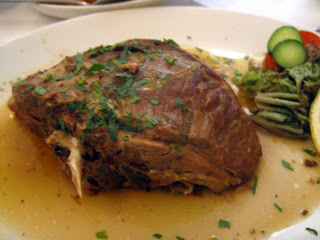 A huge knuckle of Lamb had been cooked long and slow until the meat fell easily from the bone into a puddle of the cooking juices underneath. But it was a relentless eat and working through the second half of it was very, very hard going. 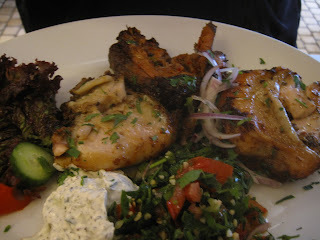 HS's grilled meat platter tasted better than it looked with it's chunks of mystery meats and desultory salad. It sated him but with very little joy. 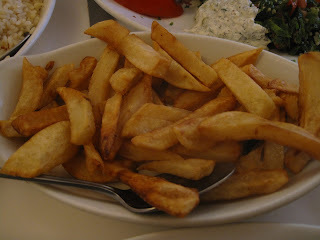 Chips were actually ok in a sort of re-cooked old school way, but the overall feeling about the food was that we were in some sort of parallel universe: imagine, if you will, a land where Theodore Kyriakou had never come along and revolutionised Hellenic cooking ten years ago. 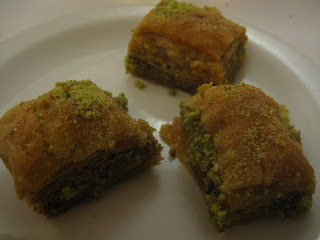 Surprisingly, the best part of the meal came at the end: honeyed Baklava was as good as you’re going to get – it really was melt in the mouth stuff. I suspect it may have been bought in. Coffee lacked the requisite kick but HS was happy with his minty tea. After about ninety minutes that was it. We were back in the street, the sound of people having a whale of a time ringing in our ears. There’s a Greek word Kopiaste. It’s an invitation to come and share and eat and generally make yourself at home. What’s the equivalent for bugger off and leave us alone ? Just wondering. Jeez, you really took one for the team there. For some reason there is a local infatuation with this place. It used to be much better when it was in Primrose Hill, now I find it thoroughly dispiriting (like near neighbour XO opposite). Last time I was here, had grilled fish (can't remember what) that was flabby, overcooked and dumped on the plate. 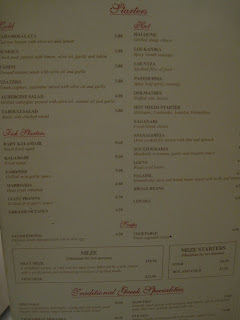 Artigiano, around the corner is a pretty good Italian however. I think you were a bit unlucky. It's hit and miss, but not that bad. You missed out on a nice local restaurant just a few doors down on the left as you face Retsina. Beyoglu is turkish. Not as authentic as your Ocakbasi gaffs but has a nice home cooked flavour. Anthony - I have to take issue with your view of Artigiano. i've eaten there many times, until finally I gave up on it. Expensive and often very poor. by the way - Belsize park is not full of ex-public school people at all. It's not exactly mixed but it isn't Clampham or Battersea either. I'll take your word for it but we write as we find. What do you expect from a restaurant named after a drink that resembles, and is probably mostly used as, drain cleaner. 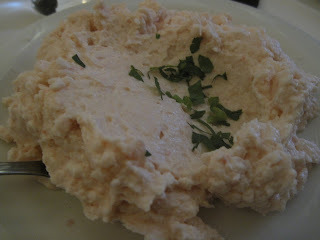 You are very brave eating in any Greek or Greek Cypriot restaurant in the UK generally speaking they mostly serve Skata and their owners are a disgrace to their countries of origin. Lebanese and Turks do a fair job at representing their respective nation's cuisine - Greeks and Greek Cypriots disgraceful. I observe a policy of zero tolerance with places like this or even the ever popular Lemonia - I wish Jay Rayner would retract his mildly positive review it remains a blot on his otherwise excellent record. Well, we always go in with the best of intentions. 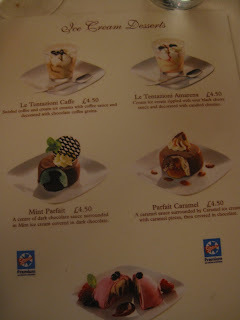 It's just a shame that one can't rely on even a basic level of decent food like, say in Spain. PS Are those naughty words at the end of your post ? I've got a feeling those are not very nice words.